Never tried painting on glass? Well, what are you waiting for? 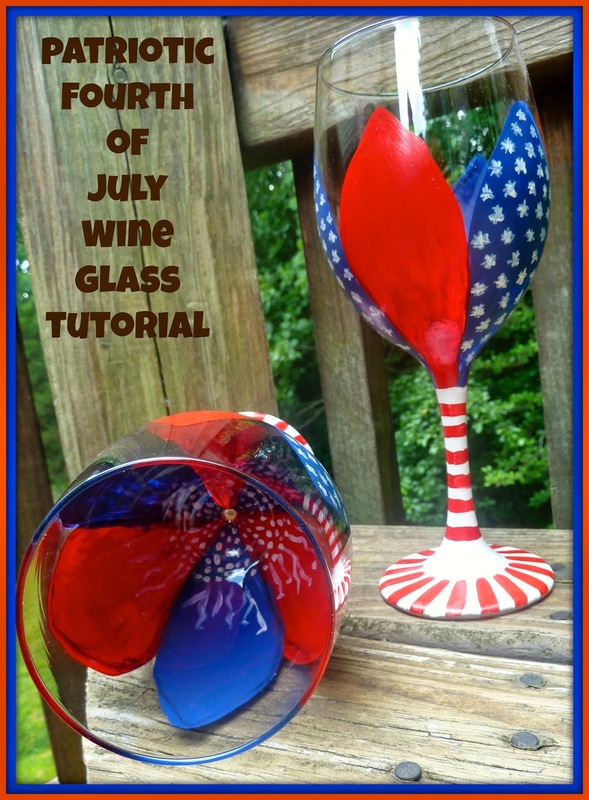 This tutorial takes you step by step you through the entire process for painting patriotic flower wine glasses! Acrylic gloss paint dries quickly so it’s easy to paint in layers and allow each layer to dry before beginning the next one. As a result the petals of the flowers are on the outside and when you look in the glass you will see the inside of the flower. These fantasy flowers in red, white and blue are just in time for the Fourth of July! After the paint dries, bake the glasses in your home oven and they will be top rack dishwasher safe although I always recommend hand washing. 2. Wrap the tape measure around the bowl of the glass. Attach with clear tape. Thin some black paint with water and make dots two inches apart for a total of six. (My wine glass was 12 inches in circumference. If yours is smaller make allowances for six equal sections. Remove the tape measure. Using the thinned paint make petal shapes using the dots as guides. It is not important to be perfect since flower petals are not perfect. 3. Turn the glass over and work on the outside bottom of the glass. Using the liner brush begin making dots with the white paint a little up the stem, on the bowl, and base of your petals. Let dry. Add several wiggly lines on each petal. (See photo) Let dry. 4. Using the large flat brush and blue paint fill in the petals skipping each one. You will have three blue petals. Let dry. Rinse your brush and fill in with red paint on the remaining petals. When dry repeat this process for a second coat of paint. 5. Rinse out your brush and add some white paint and cover the stem and base of the glass. Let dry. 6. Using the liner brush make small asterisk shapes on the blue petals in a random pattern, filling it in as shown. Repeat for other blue petals and let dry. 7. Using the small flat brush make red stripes on the base of the wine glass in a spoke like pattern and let dry. To finish make some red stripes on the stem of the glass with red paint and the small flat brush. Let dry. If there are any mistakes you can use a cotton swab or toothpick to scrap it away. Before you bake your glass if you have made any major mistakes you can always wash it off and start over. These are really cool! I'm going to have to try it.